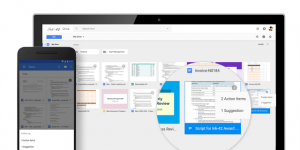 One of the core promises of Google Docs is to help you and your team go from collecting ideas to achieving your goals as quickly and easily as possible. That’s why last month we launched Explore in Docs, Sheets and Slides — with machine intelligence built right in — to help your team create amazing presentations, spreadsheets and documents in a fraction of the time it used to take. Today, we’re introducing five new time-saving features designed to speed up and simplify the way you work, so you can focus on bringing your team’s ideas to life. You can also manually assign an Action Item to someone in the Docs, Sheets and Slides desktop and mobile apps by mentioning their name in a comment and checking the new Action Item box. The assignee will get an email notification and see the Action Item(s) clearly highlighted with a blue bar when they open the file. Since its launch in 2008, more than a billion questions have been asked in Forms, allowing us to identify common patterns, like question types and the response options that usually go with them. With the help of neural networks, we can now predict the type of question you’re asking and suggest potential responses for you to choose from, giving you back about 25 percent of the time you used to spend creating a Form. Let’s say you’re planning an all-day event at the office and need to know which day works best for your team. When you type “What days are you available next week?” Forms will intelligently determine that “Checkbox” is the ideal question type, and generate related response options that you can add one by one or all together. Also debuting today is a top-requested feature from our business and education customers — the new “File upload” question type. Your respondents can now upload files from their computer or Drive — all of which are neatly collected for you in a new Drive folder. Note: This feature is only available for G Suite customers in Forms shared within their organization. Last year, we launched Voice typing in Docs on the web to help you capture ideas, big and small, without lifting a finger. Today, we’re adding more ways to format and customize content with commands for changing text color, deleting words, inserting links and comments, plus a number of other ways to format, hands-free. We want you to be as productive and collaborative as possible, regardless of the tools you choose to work with, so we’ve partnered with Slack to make it even easier to work with Google Docs files. With a click of the “+” button in Slack, you can bring files from Drive directly into a conversation with your team, or create new Docs, Sheets and Slides files right from Slack. You can check out more details on Slack’s blog. With the introduction of Explore, and more and more updates to products that build in machine intelligence, taking back time spent on mundane, repetitive tasks will only get easier with G Suite. Now, you can focus your energy on creative and strategic work, not busy work.